Can you have your cake and eat it to? Promotions are alive and well. 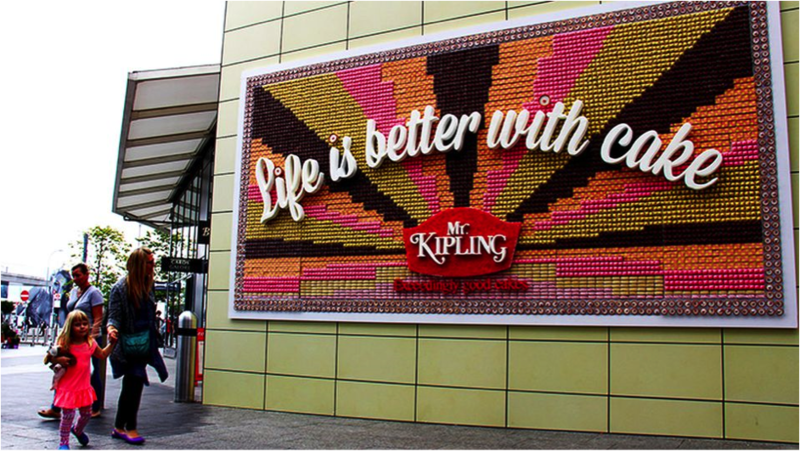 UK’s largest manufacturer of cakes and baked products since 1976 Mr Kipling, have created a wonderfully engaging billboard in one of London’s busiest shopping centres, Stratford City. The billboard included 13,360 edible cakes, each one being devoured over 8 hours, after taking 8 hours to assemble. The campaign ‘Life is better with cake’ was created by JWT London. There are many interesting marketing communicaiton elements to this promotional campaign. Yes it was great at raising awareness, but even more effective is when you look at the placement of this billboard. Westfield Stratford City is one of the largest shopping centres in Europe; houses UK’s largest casino, estimated Centre employees is 20,000, parking houses 5,000 cars. Further, the surrounding area is home to 4.1m people in the surrounding catchment areas. It is adjacent to London Olympic Park, East Village and Stratford regional and international rail stations. For brand exposure to as many eyeballs as possible, this placement really worked. When I look at campaigns, I always analyse and ask, how could this have been done better? And without knowing all of the information about this campaign, these are my thoughts. First, data. Did they collect any? While ‘Content may be King’, data allows your brand to create relevant content. Mr Kipling could find out many things, including something as simple as what new cakes need inventing. Now that would be a cool crowdsourcing campaign! Data would enable Mr Kipling to have two-way conversations. Next, I wonder what social media was utilised to drive traffic to the Billboard promotion? The hashtags used was #BetterWithCake, so they will have lots of insights from this. Instagram and Pinterst would also have been great channels to use. The use of PR was an obvious media tactic and one that sees many blog (including this one) and news posts talking about this tasty story. Sorry, I couldn’t resist that pun! When you look at past campaigns from Mr Kipling, you can see that they love giving away their products. And who doesn’t like cake? This isn’t the first time that Mr Kipling has used a promotional strategy. In 2012 they used a transit campaign dispensing 500 pieces of cake per day, in 19 cities across the UK. Resulting in over 130,000 pieces of happiness being consumed and importantly, curing hunger pains! Are they going to rival Coke with their “Happiness” campaign? ← Are We Getting Too Sensitive: Do Brands Need to Rethink Using Global Campaigns? hehehe, you’re either very tall or they have a ladder! Or you’d want to be early!